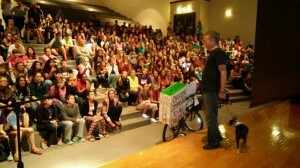 Six hundred students from Liberty Middle School in Morganton, North Carolina were a perfect audience as they sat and listened and asked great questions about One Million Acs of Kindness. A big thank you to Mrs. Barnsback and Mrs. Miller for their help with my visit. Thank you as well to Miles for caring for Bogart. This entry was posted on Sunday, October 12th, 2014 at 3:18 pm	and is filed under Kindness. You can follow any responses to this entry through the RSS 2.0 feed. You can leave a response, or trackback from your own site.